When I am not crazy-busy doing SAHM things, I sometimes dabble in cake-making. I’m not crazy about the baking part, too messy, too worried about the taste/flavor/texture of the cake/frosting – too stressful. But a necessary evil if one is to be a cake-maker. Although licking the beaters does ease the pain. I like playing with making the decorations and getting the cakes look pretty. Fondant is grown-ups’ Play-doh. Frosting is… well, frosting – great at any age. 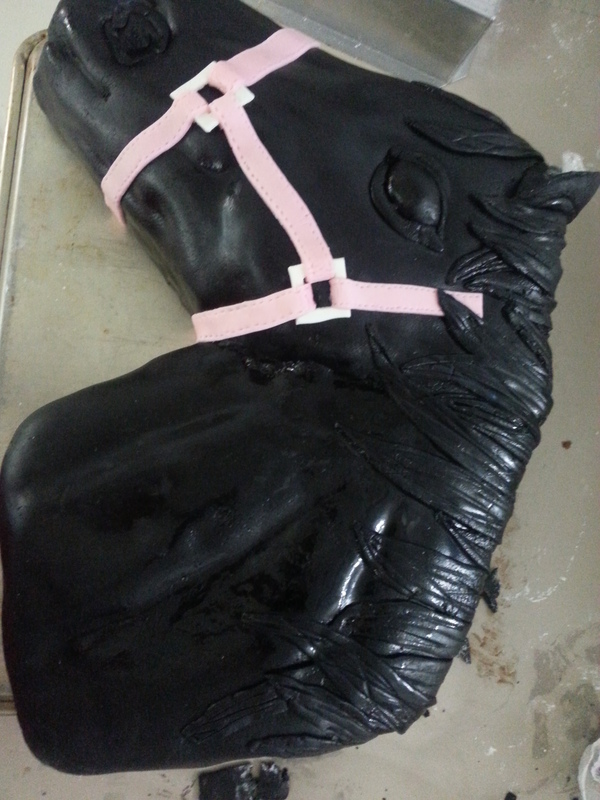 Until then, the most complicated thing I had made out of fondant was a bow. So I mulled, hemmed & hawed, stressed about it and then said yes. It took a lot of planning, and a lot of “doing-ahead”, but it came out better than I expected. I could not have done it without staring at Deborah Hwang’s pictures the entire time! I started with a rough sketch for Kylie, so she could see what I had in mind. 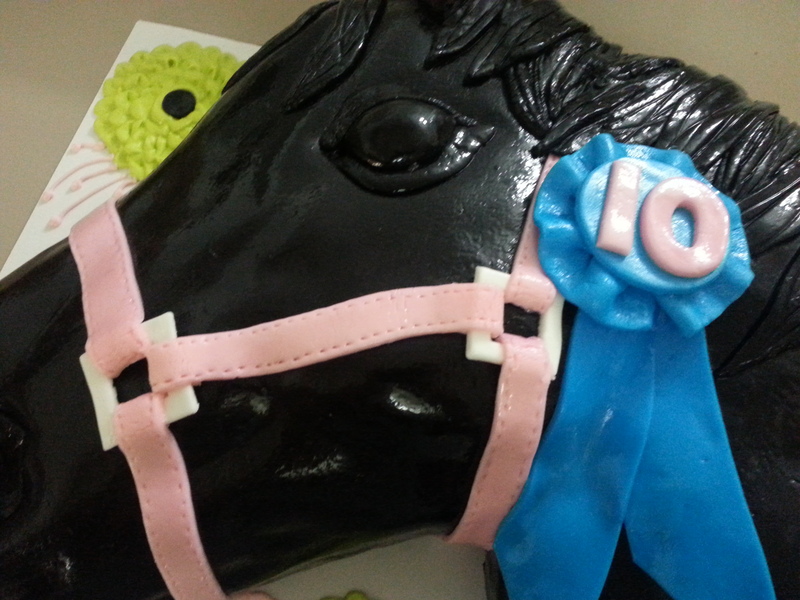 From there we were able to tweak a few details to match her vision for the cake. I’m surprised she trusted me after seeing my sketch of this “almost-not-quite-horse-like-but-not-really-horse” creature. Nevertheless, she did and I got to it! 1. 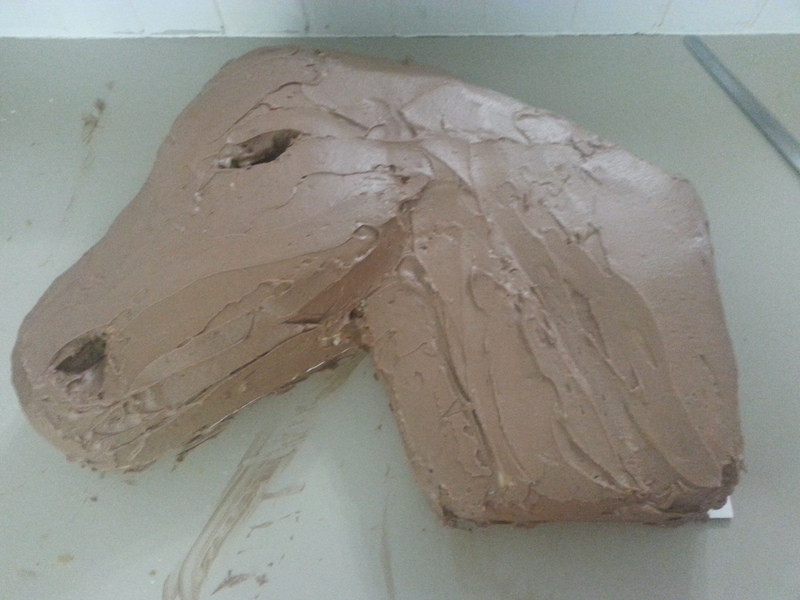 I made 4 – 13″x9″ vanilla cakes using this recipe I found on cakecentral.com which was supposed to be good for carving. I made the layers 5 days before the cake was picked up, wrapped them tightly in plastic wrap, and froze them. This was a great time-saver. Frozen cake also carves better. 2. I also made the chocolate marshmallow fondant * for the body and hair of “Monkey” ahead of time, and used black-gel coloring. I tripled this recipe. The night before I needed the fondant, I set it out on the counter so it could come to room temperature by the morning. 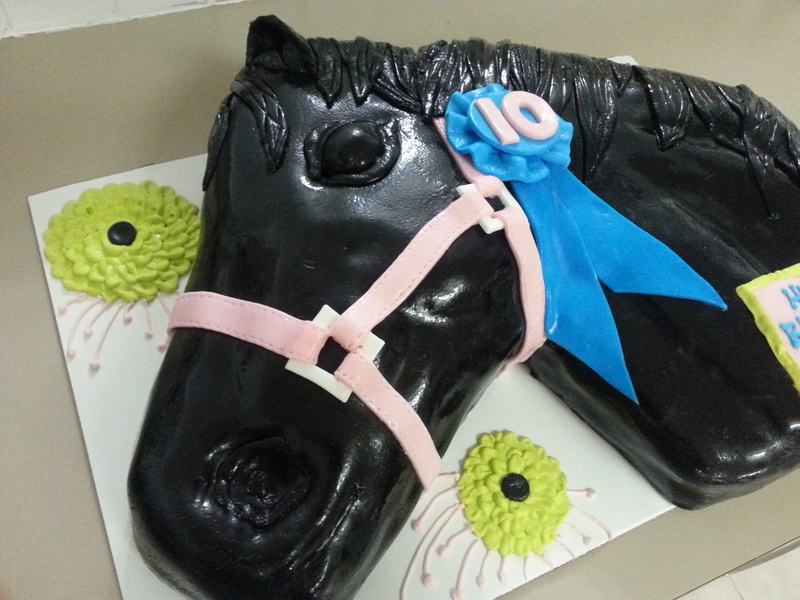 Btw, this fondant is yummy! Like a tootsie roll! 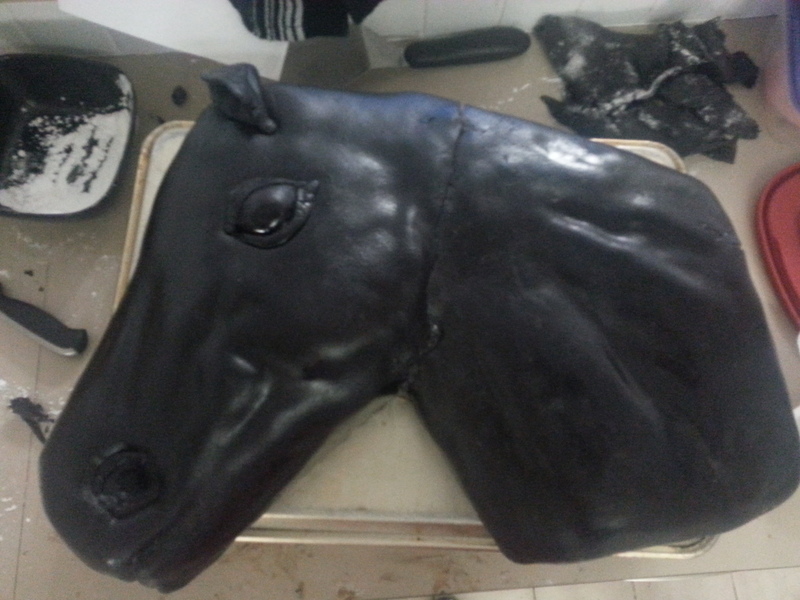 *My fondant was a little dry and started to tear when I rolled it out, so I had to cover the horse in 2 smaller pieces. It probably had something to do with tripling the recipe, or my generous use of powdered sugar while rolling it out. 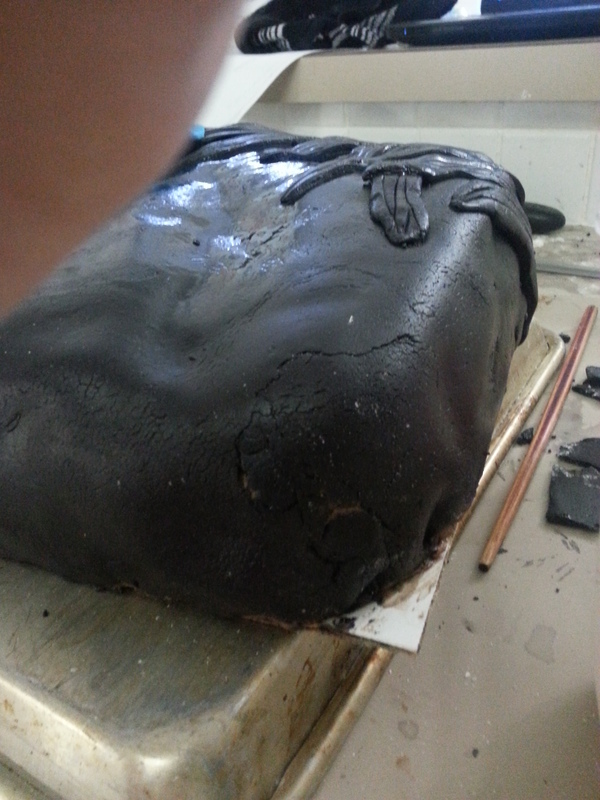 Since I am a rookie fondant worker, I just covered a lot of the tearing with the other fondant decorations. 3. 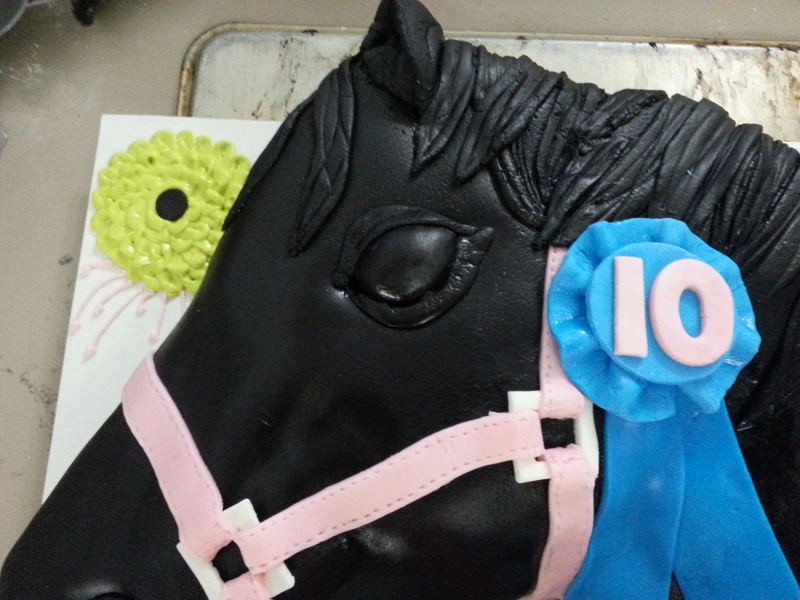 I used this recipe for marshmallow frosting to make the additional colors needed for the bridle and ribbon. 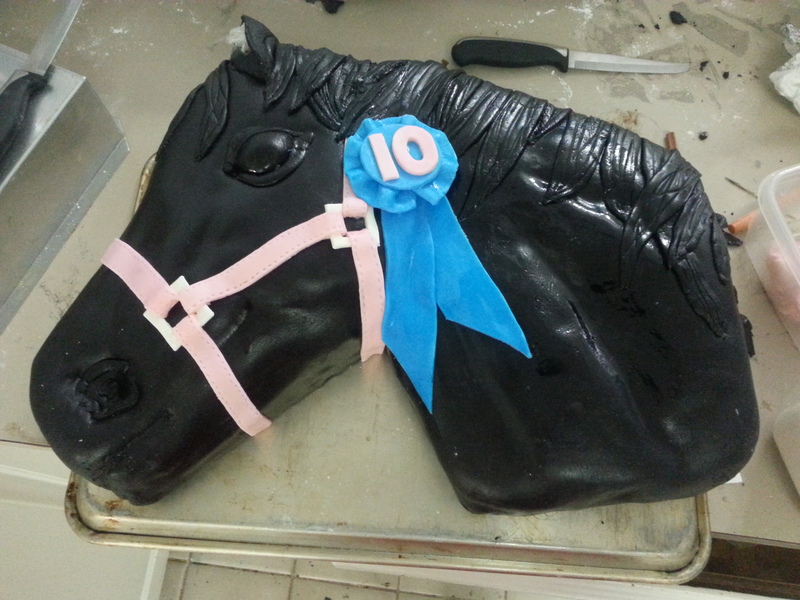 I made some of the decorations ahead of time- the bridle links and the ribbon head along with the numbers (I made the bottom part of the ribbon fresh so the fondant could mold to the shape of the horse’s neck). 4. For the writing and flower decorations, I used Wilton’s meringue powder and their instructions for Royal icing. I divided it and used gel dye to get the desired colors. 5. The cake was filled and covered with this whipped chocolate frosting. I made 1.5 times the recipe…. and I also added more whipping cream and powdered sugar to the remaining frosting after I filled the cake and realized that I didn’t have enough to cover the cake. The whipping cream just made the frosting a little fluffier and airy. I placed 2 cake layers side by side (long sides touching), and then placed the other 2 layers on top of them. 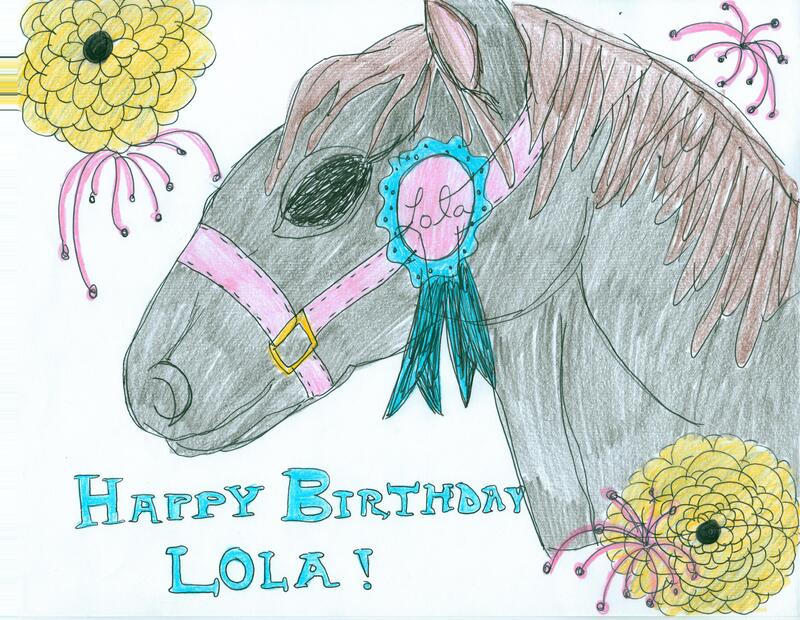 I taped 4 sheets of paper together to sketch my horse. I cut the paper out to 19″x14″ which was the size of the Wilton’s cake board that I purchased from Wal-Mart. I sketched a picture of a horse head onto the paper and cut it out. 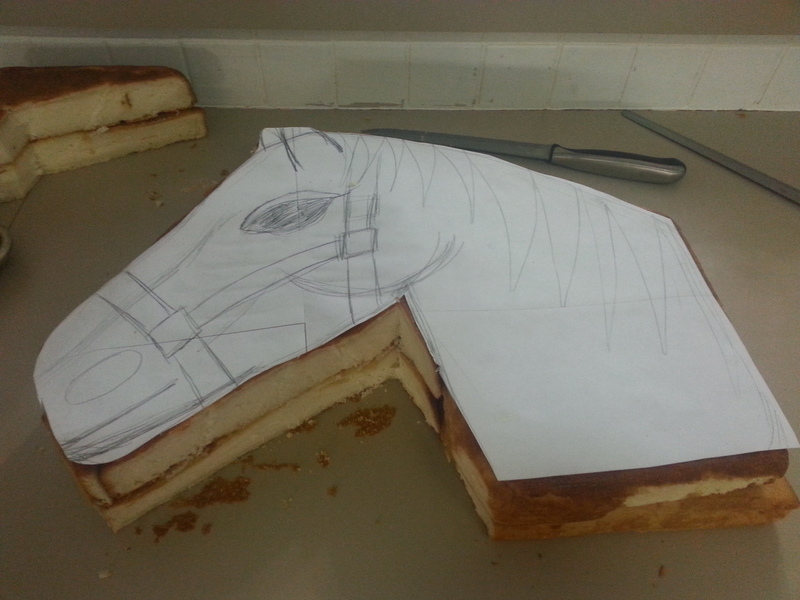 I placed the paper on the cake layers and cut the outline of the horse. I used the “scrap” pieces to fill in the tip of the nose and the top of the head. Then I placed these layers onto a cake board and “glued” the bottom layers onto the board using frosting. 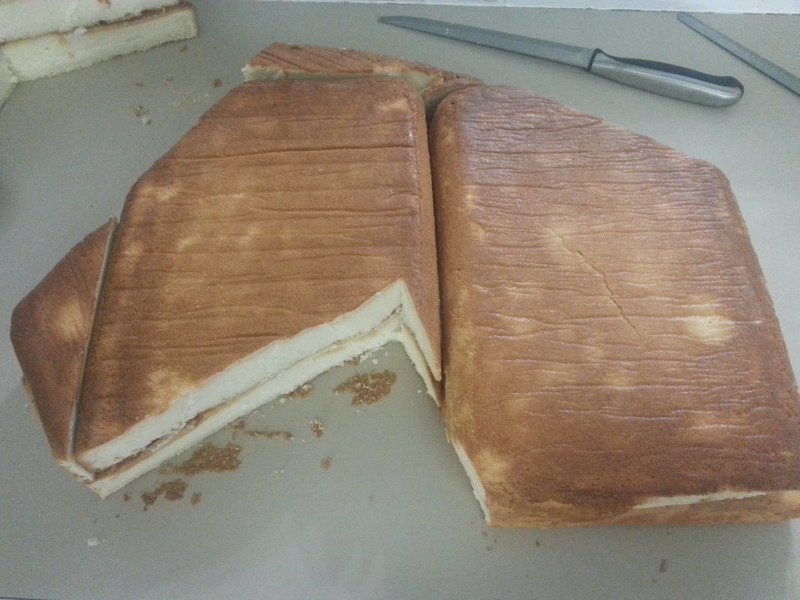 I trimmed the cake board to the shape of the cake, leaving a 1 cm border for the fondant (not shown in pics). 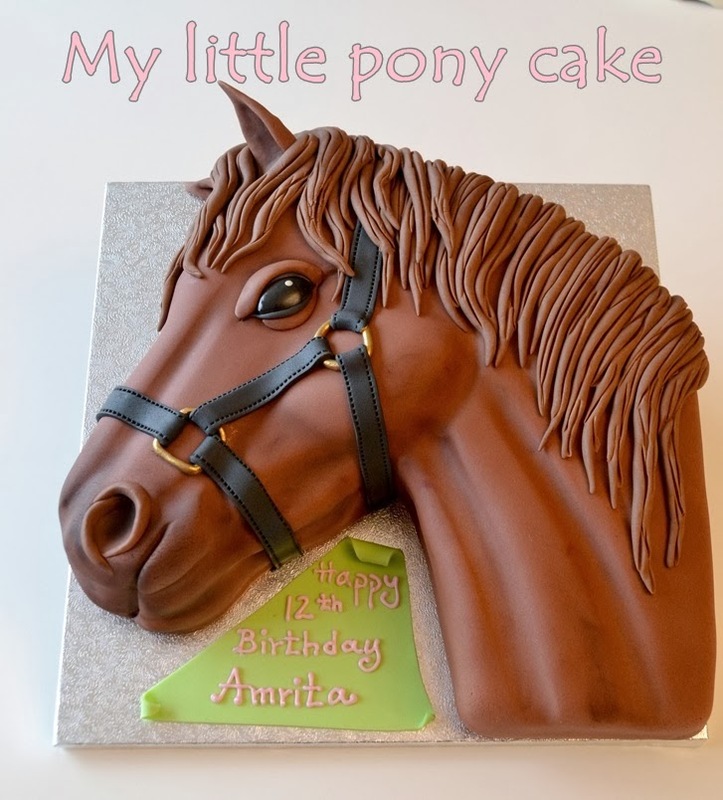 While looking at the inspiration cake instructions online, I tried to copy the way she carved indentations into her horse head. On a side note, don’t cut with the knife blade facing you or another body part- I got a really deep cut on my thumb from it. 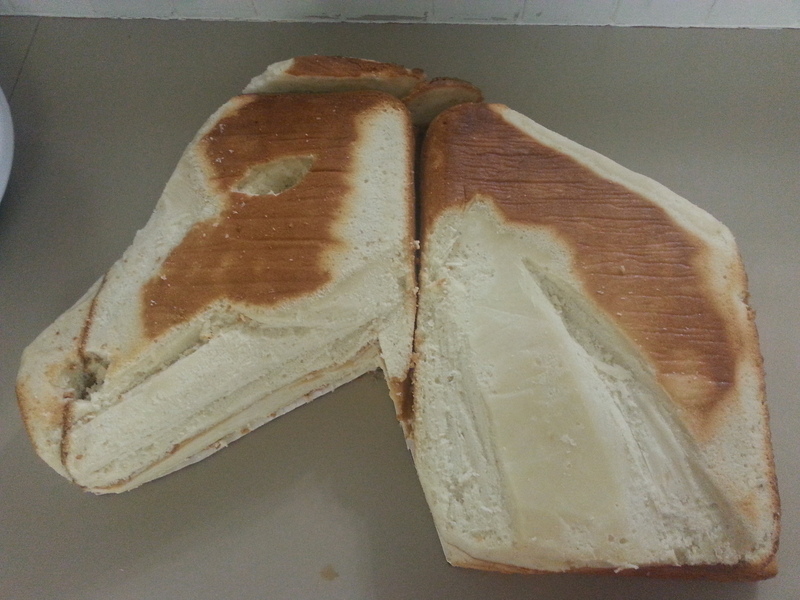 A frozen cake takes a little more muscle to carve, but I think the cuts come out smoother and cleaner. After carving, I ran my knife between the layers in order to separate the top layers from the bottom ones. I frosted the bottom layers and placed the corresponding layers on top. 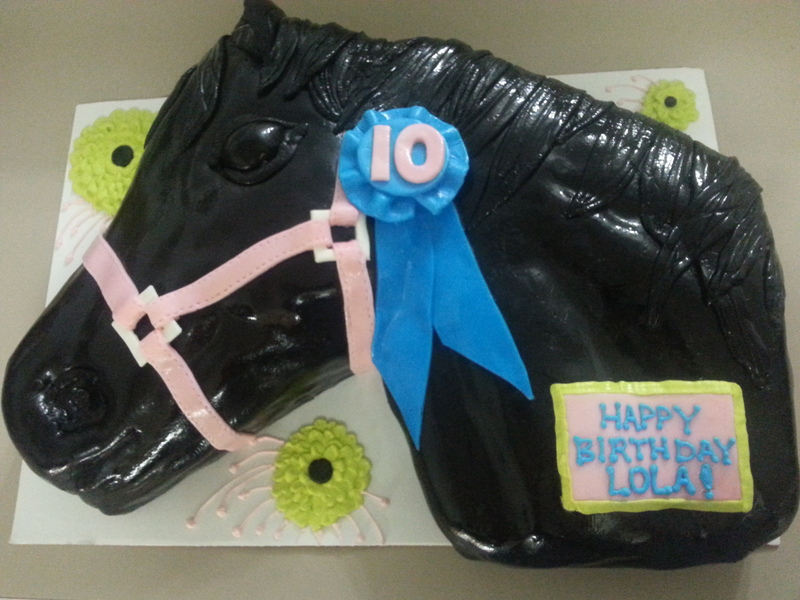 I used frosting to “glue” the layers together, especially the small nose and top-of-head pieces. This is where I saw I wouldn’t have enough frosting to cover the entire cake, so I added more whipping cream and powdered sugar to the remaining frosting and whipped it until fluffy. Then I frosted the cake. Instead of covering the cake in one glorious, seamless, gleaming piece, I had to roll out 2 separate smaller pieces which left a seam on the neck. I was ok with that because I knew the ribbon would cover most of that. I also had some uncovered parts on top of the head, which was okay because I would cover them in horse “hair’ later. I then added an eye and the eyelids. Nostrils and ears came next. 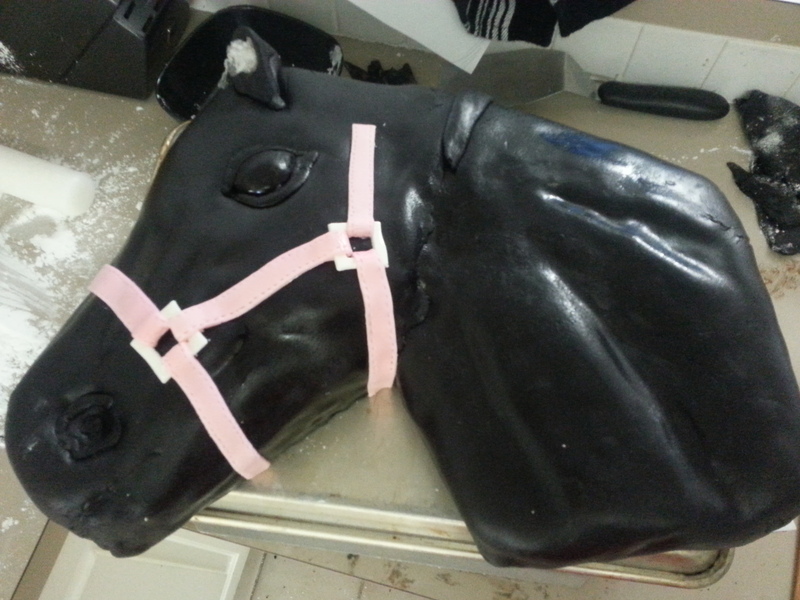 I used some balled-up plastic wrap inside the ear as a support until the fondant dried. 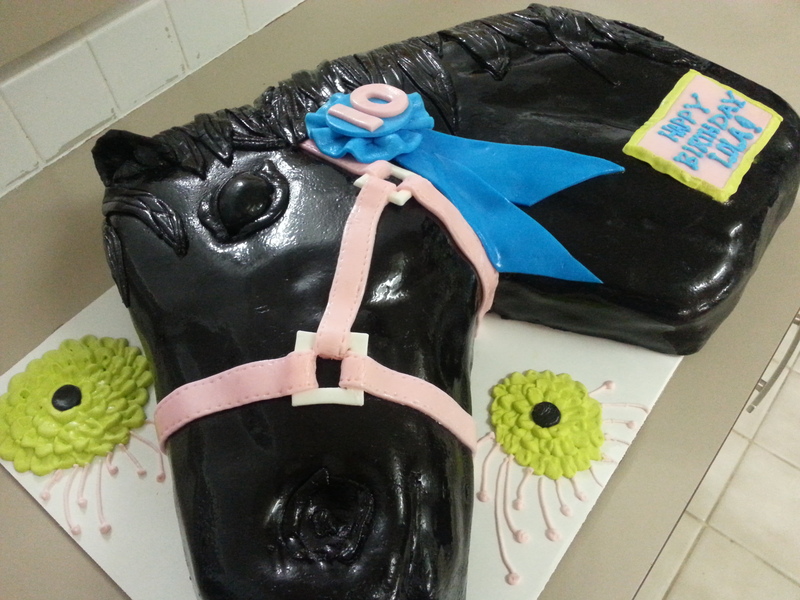 Why fondant?? why you have to do that??!! In some areas where the cracks were smaller, I used a damp paper towel to gently smooth them out. Kinda like cellulite after a tan – still there, but less noticeable. Next, I cut out the bridle pieces and added them to the previously made bridle buckles. I used a paintbrush to add a very thin layer of water to the back of the bridle in order to glue it to the horse. I used a toothpick to make the “stitching” on the bridle. I added hair by cutting out strips of fondant and made lines in them by running a toothpick over them. I strategically placed them over large cracks in the fondant. I was hoping to make more 3D hair, but I ran out of fondant. Then I glued the head of the ribbon on using some royal icing. I added the bottom of the ribbon pieces on using a little bit of water on back. Now the horse head was done!!! I used a damp paper towel to gently rub off any bits of stray fondant or powdered sugar. Finally I placed the cake on a full 19″x14″ cake board and glued it on with frosting. I used the royal icing to pipe the decorations onto the board. 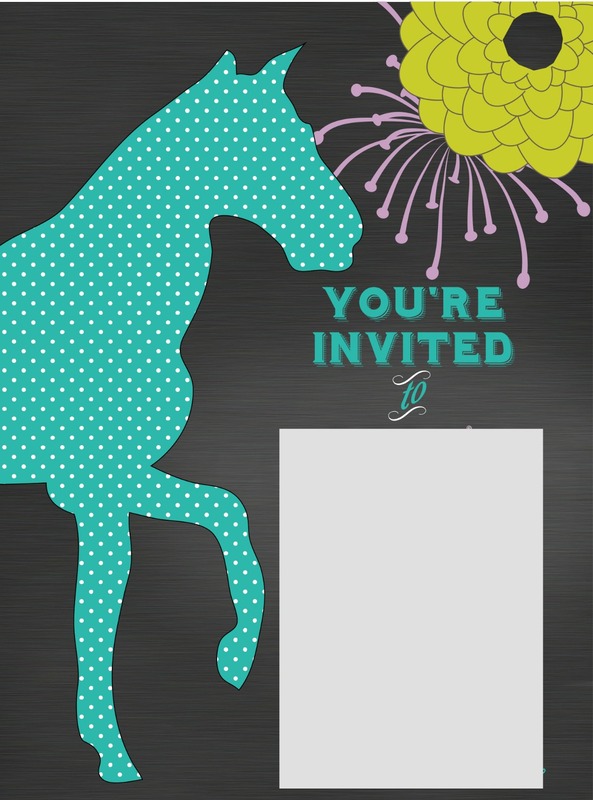 Her invitation was the inspiration for colors and decorations on the cake board. I am a wife, mother, sister, aunt and Jesus lover. I like to create and "beautify" things, but mostly I like to give new life to rejected clothing or objects. This blog is the outlet for the frugal, frustrated artist in me. This is AMAZING. You have so much talent! 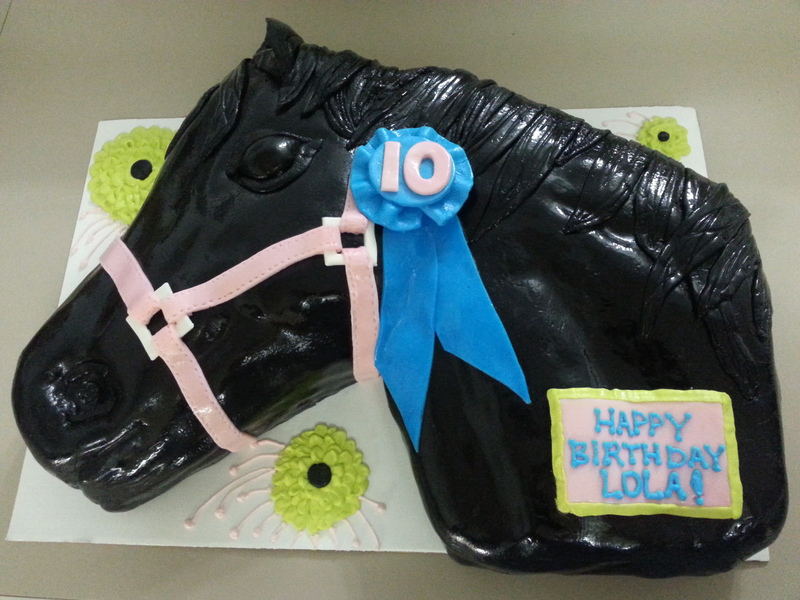 Lygia, that’s an awesome cake . What a lot of work and you totally pulled it off! If I’m not mistaken the fondant bow was for my birthday cake. haha, yes, it was for your birthday!! That’s where it all began! Miss you friend! !